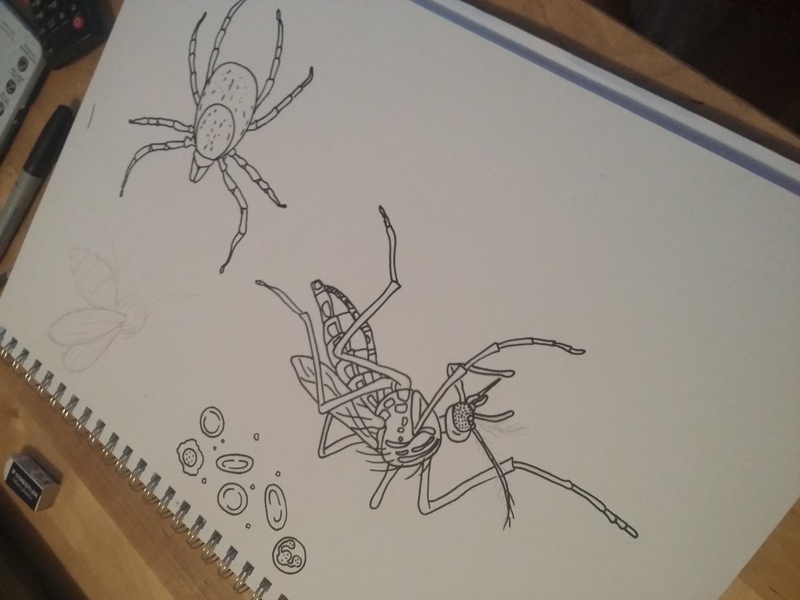 CVR PhD student, Stephanie Cumberworth (@S_Cumberworth) – who works in the Kohl lab investigating Zika virus – tells us all about the not-for-profit virus-themed colouring book produced recently by the CVR. Find out where the idea came from & how we made it, what we’ve done with it so far and what we’re going to do with it in the future. Adult colouring books have been hailed as a top stress busting activity. Their huge popularity means that you can find one based on just about any theme, ranging from delicate floral imagery, to scenes from your favourite blockbuster (big thank you to my friend Alex for my ‘The Lord of The Rings’ colouring book). Naturally, it made sense to a group of scientists at the CVR to tap into this market, all in the name of science communication. The journey began in December 2016. Deadlines for various science festival applications were looming. A team of sci-comm enthusiasts gathered around a meeting room table for what would be the start of the not-for-profit colouring book, ‘Art Goes Viral’. Our ideas morphed over the coming months, resulting in a colourable virology field guide based on viruses of medical and veterinary importance studied at the CVR . The book was written and illustrated by PhD students like myself, Yasmin Parr, Alexandra Hardy, Weronika Witkowska and Joanna Crispell (who is now research co-ordinator at Science Gallery Dublin), post-doctoral researcher Connor Bamford, principal investigator and MRC Fellow Ed Hutchinson with the help of CVR communications officer Siobhan Petrie. ‘Art Goes Viral’ was launched in June 2017, at an event by the same name as part of the Glasgow Science Festival (@GlasgowSciFest), and online competition with support from the MRC Festival of Medical Research. Participants each received a copy of the book and learned about viral structures by building their very own virus. The event was a hit with both attendees and volunteers alike, providing a welcome break from adult life and leaving more than a few of us covered in glitter. scientists) recently saw an appearance at the ‘Hepatitis See’ exhibition held at the Glasgow Gallery of Modern Art; an event curated to educate about living with hepatitis C.
We are currently working to provide a pay to print service (not-for-profit) in the near future, so you can have your very own hard copy of ‘Art goes Viral’. Follow @CVRinfo for updates on pay to print and further sci-comm activities involving ‘Art Goes Viral’. In the meantime, ‘go forth and be vibrant with colour’ by printing off your favourite pages (for free!) by following this link. Be sure to tweet us @CVRinfo using the hashtags #ArtGoesViral and #CVaRt to show us your artwork! 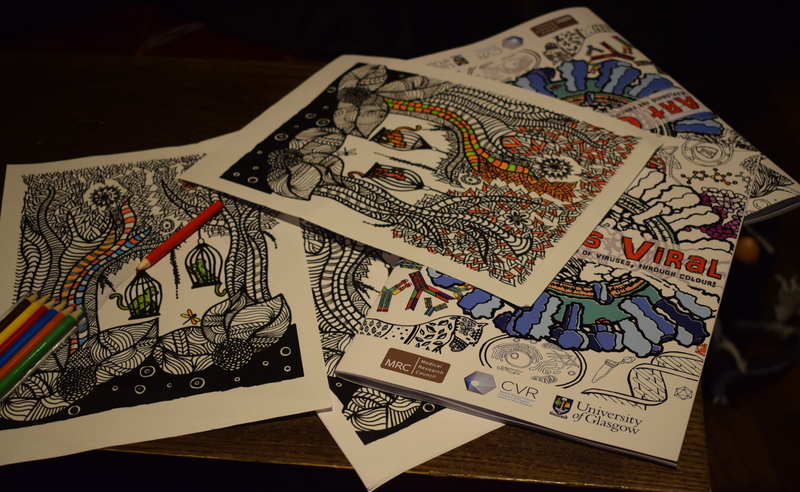 The CVR colouring book has recently been joined by some excellent microbiologically-themed colouring books, like ‘Life under the lens: A scientific colouring book’ by Jennifer Delaney, and the Microbiology Society – working with scientific illustrator Eliza Wolfson – have begun to produce their own, microbiome-themed one. Follow Eliza for more information. 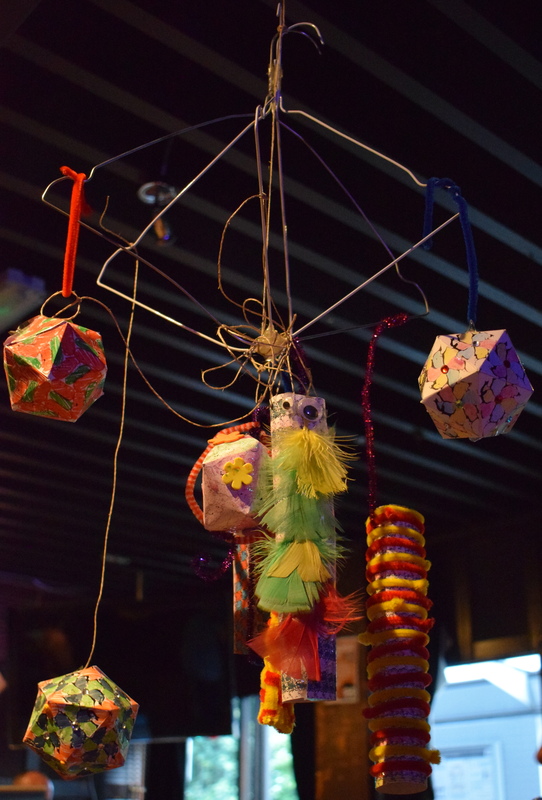 Continuing on an important tradition, #CVaRt was the third science festival event produced by the CVR, following last year’s MRC Festival of Medical Research ‘From research to cure’ hepatitis C open day and the 2015 and 2016 ( Glasgow Science Festival events. Photo credit: @CVRinfo (https://twitter.com/CVRinfo/media), Stephanie Cumberworth & Yasmin Parr.